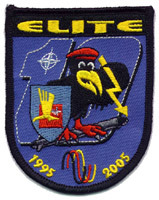 Elite 2005, Electronic Warfare Exercise in Germany. What is Electronic Warfare you may ask? Read on and I’ll explain. In a theatre of war, aircraft may be assigned a target to bomb in enemy territory. With today’s modern technology you would think that, this would be a straight forward mission. The issue is, as aircraft and their Weapons Systems advance, so does Radar equipment and aircraft Tracking Stations. Therefore, entering enemy territory is as dangerous as ever, without some assistance. This assistance is provided from dedicated squadrons, whose job it is to disable enemy Defence systems. The way these Defence units are disabled is optional, it could be blown to bits with a loud bang and a fire ball ! This may seem the best choice, but discretion is key to conflict. Preventing Radar Stations, Ground to Air Missile Batteries and Observation complexes from working without their knowledge is invaluable. The tactic used is nicknamed “Jamming” simply because that’s what they do. Transmitting signals of interference corrupt sensitive electronic devices and they may malfunction providing incorrect data or cease providing data information. This task would be done first and once completed the enemy Forces are blind to attack. The bombing mission can now go ahead with the risk of being detected greatly reduced, ensuring the safety of air crew and effective weapon release. Elite 2005 Electronic Warfare Exercise was designed specifically to train units with the role of disabling Ground Based Air Defence. We were invited to visit the Southern German Base Lechfeld, home to JaboG 32 Squadron who hosted the exercise. The aircraft which were operating from the field included Swedish Viggens, Turkish F-16s, Greek F-16s and Italian Tornados. German Reconnaissance Tornados from AKG 51 also took part in the exercise. The first sortie of the day was scheduled for 08:30 AM. The sorties lasted around one hour and thirty minutes before the aircraft returned, flying over the field then into the circuit for landing. Military Exercises are an important part of training for new and even the most experienced personnel.